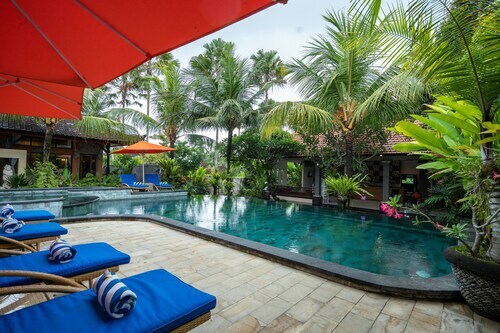 This family-friendly Tabanan villa is located by the ocean, 5.4 mi (8.8 km) from Tanah Lot, and within 12 mi (20 km) of Nirwana Bali Golf Club and Alas Kedaton Monkey Forest. Jatiluwih Rice Fields is 22 mi (35.4 km) away. 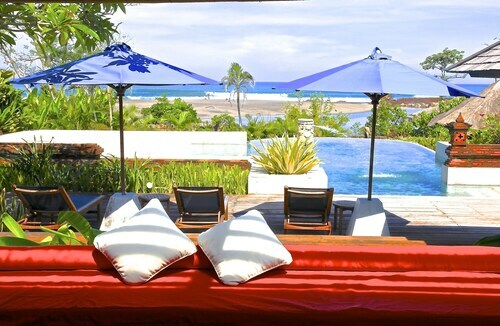 Offering direct access to the beach, this Tabanan resort is in the historical district, 7.9 mi (12.8 km) from Tanah Lot, and within 16 mi (25 km) of Echo Beach and Finns Recreation Club. Batu Belig Beach and Seminyak Beach are also within 16 mi (25 km). This family-friendly Tabanan hotel is located near the beach, within 3 mi (5 km) of Batu Bolong Temple, Tanah Lot and Petitenget Beach. Kedungu Beach and Pura Ulun Siwi are also within 9 mi (15 km). Considering a trip to Tabanan? There are just 6 options within 5 kilometres of the centre of town. The Sanyas Retreat and Villa Hati Indah are a few of several terrific accommodation options that are not far from all the action. If you're after neighbourhoods with lots of hotels, Kemenuh is hard to beat. There's 9 places to rest your weary head here. 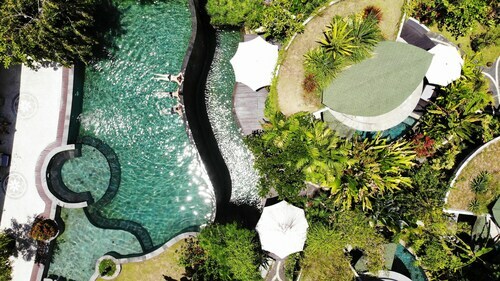 Accommodation options here include the Villa Puri Darma Agung and Anusara Luxury Villas - Adults Only. But wait, there's more! Lodtunduh is yet another Tabanan neighbourhood chock-full of options. Lodtunduh has 8 hotels, including the Puri Tupai and Fullmoon Villa Ubud. No sane person would take a trip to Tabanan without catching Tanah Lot. 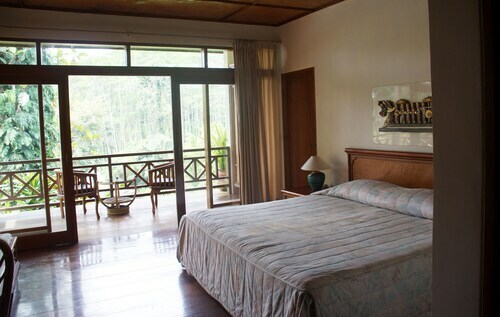 Accommodation options nearby are the Kriyamaha Nyanyi Villa and Anginsepoi Villa. 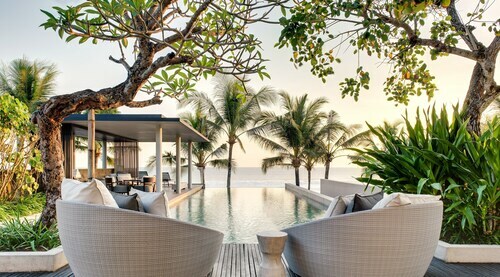 For some alternatives, try out the C151 Luxury Villas Dreamland and the Four Seasons Resort Bali at Jimbaran Bay. They are located 30 kilometres and 25 kilometres respectively from the main center. Wotif also recommends the St. Regis Bali Resort and the Mulia Villas. The first is 30 kilometres away from town, while the other is 30 kilometres away. The close by localities of Canggu and Kerobokan are definitely worth seeing. Canggu is 11 kilometres to the southeast of Tabanan, while Kerobokan is 13 kilometres to the southeast. 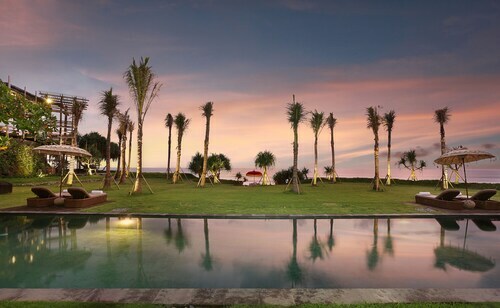 Canggu hotels are the Bale Gede Villas and Peppers Seminyak. Kerobokan options are The Legian, Bali and The Samaya Seminyak. Ngurah Rai International Airport is 25 kilometres away from the centre of Tabanan. 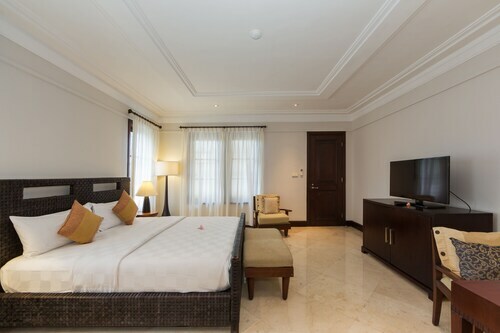 Should you wish to stay close by, you can book a room at the Temple Hill Residence Villa or the Karma Jimbaran. How Much is a Hotel Room in Tabanan? Hotels in Tabanan start at AU$78 per night. Prices and availability subject to change. Additional terms may apply.